Robert Natkin’s serene abstract paintings open up to reveal luminous worlds of color and pattern. 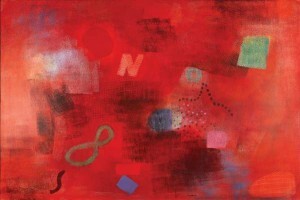 Robert Natkin, The Red One, 2003, acrylic on canvas, 40 x 60 inches. 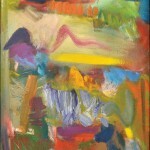 Robert Natkin, Untitled, 1958, oil on canvas, 17 x 14 inches. In 1967 Robert Natkin launched a series he called the “Field Mouse” paintings. Patterned passages of high-keyed color—grids, stripes, polka dots—drift across these canvases, held loosely together by solitary stripes and flurries of misty texture. A focus on patterns flattens the image, and we see Natkin as an artist of the intricately inflected surface. Follow the transition from one pattern to the next and the surface opens onto light-filled depths. An analogous shift in scale takes one from a view of these paintings as studies in minutiae to a feeling that they are vast and potentially unbounded. Natkin becomes the author of a dappled infinite. As the 1960s ended, the art world was preoccupied by conceptual art at one extreme and the monumental physicality of earthworks on the other. Unperturbed, Natkin carried on with the “Field Mouse” series, finding ever subtler and luminous mixtures of pattern and texture. He died in 2010, at the age of 79, having produced an oeuvre at once gorgeously complex and serenely at odds with prevailing trends. A native of Chicago, Natkin studied at that city’s Art Institute from 1948 to 1952. His schooling over, he lived for brief periods in San Francisco and New York before moving back to his home town. After a short stint as a librarian, he found a job teaching painting and became part of a group of artists that included Judith Dolnick, a painter. They married in 1957. Without a place to display their work, the couple renovated a storefront in Chicago’s Old Town neighborhood and turned it into the Wells Street Gallery. 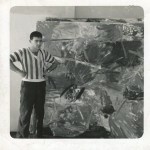 There they gave solo shows to themselves and others, including John Chamberlain and the photographer Aaron Siskind. Two years later, the couple settled in New York, where Natkin found a place on the roster of the Poindexter Gallery. His paintings of the late 1950s and early ’60s were already aglow with the rich palette that flourished so vigorously in his later work. However, Natkin covered their surfaces with brushy, agitated gestures that recall Willem de Kooning, whose paintings had impressed him during his early sojourn in New York. His distinctive mixture of clear structure and evanescent light first appeared when he channeled his brushwork into the narrow partitions of the first paintings in the “Apollo” series. By invoking the Greek sun god Apollo, Natkin celebrates light and clarity. Yet he also subjects these Apollonian qualities to his endlessly resourceful pictorial wit. Vertical forms march across the surface of each “Apollo” painting with the tranquil insistence of a row of Classical columns. Inevitable but far from overbearing, this association makes way for others that connect these paintings to the immediacies of our world. So, for example, a tall streak of shimmering white might evoke muslin as persuasively as it recalls marble. A fluted column becomes a translucent curtain gently creased by the soft breezes of a summer afternoon in a familiar climate. The aura of ancient form does not, of course vanish, for these are abstract paintings and their meanings are manifold. A zone of blue crisscrossed by white could be weathered stone or a sliver of distant sky. And occasionally a stripe of bright red or yellow has the impact, simply, of sheer color. Natkin named his next series the “Straight Edge and Step Paintings.” With this uncharacteristically dry title he pointed to the sharp focus that entered his art for a few seasons and enclosed his smaller form in clear outlines. There is an architectural feel both to these details and to their interplay, which distributes them over the surface of a canvas in orderly, almost geometric patterns. Thus it is fitting, as Leda Natkin Nelis, the artist’s daughter, points out in her essay for the catalogue of her father’s 1997 retrospective exhibition at the Butler Institute of American Art, that he dedicated several of these paintings to Louis Sullivan and Frank Lloyd Wright. For these architects are celebrated figures in the cultural history of Chicago. Moreover, both Sullivan and Wright found ways to give decorative detail free rein without obscuring the underlying structure of a building. In the “Straight Edge and Step Paintings,” Natkin achieved a comparable resolution of large and small form, giving each burst of pictorial nuance a crucial part to play in the overall architecture of a painting’s composition. Next came the “Field Mouse” paintings, named after a creature Natkin found in a poem translated from the Chinese by Ezra Pound. Open to endless interpretation, this poem is as elusive as the field mouse—or life itself. Perhaps if we were more attentive, more alive to our lives, ours days and nights would be fuller. With that thought in mind, it may well look as if the “Field Mouse” paintings are supplying us with an exemplary plenitude. Pulsing with visual incident, these works are, as we’ve seen, both wittily delicate and grandly expansive—and in no respect as timid as their title might suggest to a viewer unaware of its source in Pound’s translation. In 1968 the Galerie Facchetti, in Paris, included several “Field Mouse” canvases in an exhibition entitled “Timeless Paintings from the USA.” The following year, the San Francisco Museum of Modern Art presented a Natkin retrospective. Early in the 1970s, Natkin exchanged his brushes for paint-soaked sponges wrapped in textured cloths and pieces of netting. Pressing these sponges to the canvas with varying degrees of pressure, he achieved results ranging from fine-grained color patches to sharply defined grids. In the “Intimate Lighting” series, he favored graininess, often allowing textures to vanish into large monochrome passages over which patches of texture and the occasional solid form float and congregate, sometimes, into constellations—an effect the artist described as “scatter balance.” Then, in 1974, came what would have been unimaginable until then: a decision to abandon color. This unexpected development had its origins in a practical problem. 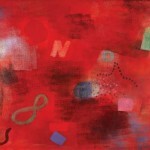 In 1974 the Holburne Museum in Bath, England, offered to mount an exhibition of Natkin’s recent paintings. The offer came, however, with a proviso: catalogue reproductions would be in black and white. Refusing to subject his colors to this limitation, Natkin decided to paint a series of black and white canvases for the show. This turned out to be impossible for him to do. The “Bath” paintings are near-monochromes, some of them gray and others in somber shades of blue. Their textures are restrained. Combining this new development with the vertical structure of the “Apollo” paintings, Natkin may have made allusions to the severe, 18th-century geometries that shape the city of Bath’s distinctive architecture. By recycling the “Apollo” format, Natkin arrived a point of culmination, provisional yet impressive, and in 1976 the Moore College of Art Gallery, in Philadelphia, gave him a retrospective. A visit to the Klee Foundation in Bern, Switzerland, in 1977, turned Natkin away from the softer focus of the “Bath” paintings and back to diamonds, rectangles, and polygons of the kind that made their first appearance in the “Field Mouse” series. In the “Bern” paintings these forms are more salient than they are in their earlier incarnations. Rendered in black or deeply saturated primaries, they occupy the canvas with the insistence of major landmarks. Landscapes are implied, and these implications grow stronger in the paintings gathered under the “Hitchcock” label. Natkin’s devotion to modern painting and its history never interfered with his love of the movies. The tense plots of Alfred Hitchcock were his favorites, and, while it can’t be said that Natkin’s “Hitchcock” paintings have the feel of murder mysteries, they do make explicit the elements of story-telling that lurk in all his imagery. Chief among these are the mise-en-scène and the seeming logic that links the disparate elements of a plot into a whole. In a film or novel, this linkage produces the linear progression of a story. In a painting, it charges an image with a visual order that leads the viewer from one point to the next and the next, until the work is fully seen. Of course, there is no one way through a painting’s “narrative.” Most of Natkin’s works offer endless options. 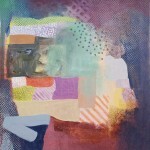 In the “Hitchcock” paintings, however, his forms show a heretofore-unseen inclination to settle into configurations evoking rather specific urban settings. Or forms flatten into patterns suggestive of maps with strong indications of the proper path for the eye to follow. Early in the new millennium, Natkin displaced the large, organic forms of this mural to canvas. Reshaping them only slightly and adding minimal indications of facial features, he produced a series of portrait heads. 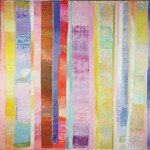 A selection of these paintings was shown at the Butler Museum in 2003. Several months before the exhibition opened, Natkin wrote to Lou Zona, the museum’s director, “In most of my heads, the brush, the color, the paint ties und unties story and narrative while the audience is aware of other aspects of spectacle, of show.” Natkin’s last paintings bring those other aspects to the fore. Dispensing with indications of eyes, nose, and mouth, he let form and color stand on their own, as thoroughly non-figurative now as they had been through his career. These “Abstract Paintings” sum up much that went before them. Yet they register a change, as well, for it is in them that we see the culmination of the artist’s slow drift away from up-front pattern and texture into deep, always playfully fictive space. Natkin once wrote, “I sew together fragments of cloth unaware of the dress I’m sewing, unaware of its final look and function.” His image of himself as an improvisational seamstress fits well with the feeling of unforced harmony that prevails throughout his oeuvre. Every element of an image seems to acknowledge its immediate neighbors as pleasant surprises. Nonetheless, Natkin had a command of large structure. Plying his metaphorical needle up close, from moment to moment, he was able at the same time to step back far enough to see the big picture. And thus he endowed his images with architectural coherence and sometimes even a touch of grandeur.